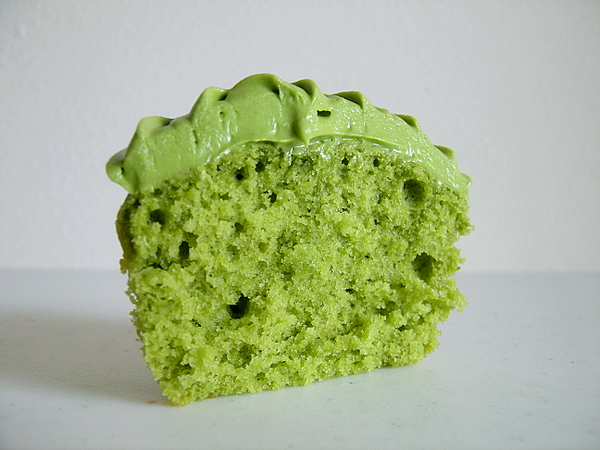 One week after I placed my order for green tea powder (also called matcha) it arrived in my mailbox, and one day later, today, I baked my green tea cupcakes. With my two wild children running around under my feet, I had some unfortunate mishaps – I spilled flour on the floor, I spilled about a whole tablespoon full of my precious matcha on the floor, and when making coffee while the cupcakes were baking I spilled a bunch of coffee grounds on the floor! Normally I’m not quite as messy, but it was one of those days I guess. Now anyway, I followed the same recipe I found here – Magnolia Bakery’s vanilla cupcake recipe, which I halved. I somehow ended up with 13 cupcakes though. I added 1.5 tablespoons of matcha to the batter. I absolutely love this green color, it was perfect. The color darkened slightly once they had cooled. I used Chockylit’s green tea cream cheese frosting, which I also halved, but still ended up with plenty of leftover frosting. I figure this is because I accidentally used 8 ounces of cream cheese instead of 6 ounces. The only other thing I did differently was to use the full amount of matcha (1 tablespoon) instead of halving it. Hey, I wanted to be sure I’d taste the green tea! Aren’t they beautiful! The frosting was a little too soft to pipe, so I let it sit in the refrigerator for a little while. I love how creamy the frosting is, and I can really taste the matcha. The cupcake itself is moist and fluffy, and I was a bit worried I had over-mixed the batter, but it turned out perfectly. I am refrigerating the leftovers because of the cream cheese in the frosting. Refrigeration will change the texture of the cupcake, but it will definitely still taste as nice. 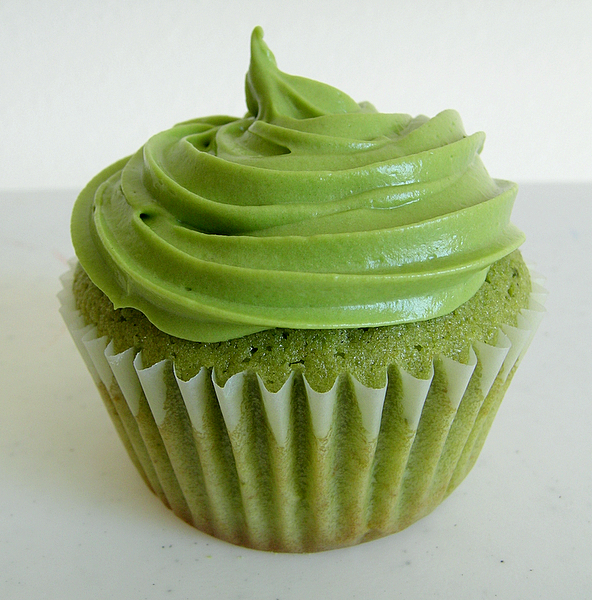 A big thank you to Cupcakes Take The Cake for posting my green tea cupcakes on their blog! I think you’d like these too. I love green tea ice cream myself. You can even make green tea ice cream with the same matcha powder used in this recipe – just mix it with softened vanilla ice cream. Is there something special about the gree tea powder? Is there a certain kind i need or just plain green tea powder? No, nothing special about the green tea powder. Just remember it’s not the stuff in tea bags, it’s just plain green tea powder. I think you can find it at Whole Foods, but I had to order it at an online tea store b/c I couldn’t find it at ANY local store. Sounds great! I have been meaning to bake matcha goodness ever since I bought my first matcha box last year. 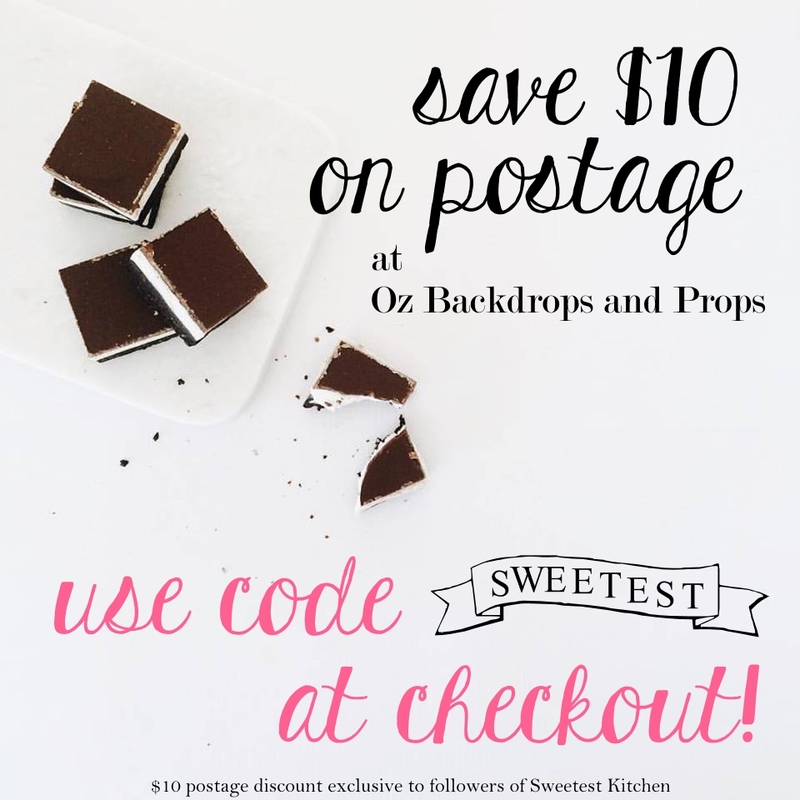 I have yet to try, but your cupcakes look too good to just drool over! I look forward in at least giving them a go at some point this week or weekend! I did end up making some matcha scones once, so I suppose baking matcha counts there, but cupcakes are just too good! I love these cupcakes! I’ve made them several times now, but with extra matcha (~2 tbls total). One addition I HIGHLY recommend is blueberries! Soooo delish, and the blue and green look lovely together. I also have been making a matcha buttercream frosting instead, as I always forget to buy cream cheese. That frosting recipe is from matchasource.com, but requires more cream/milk than they advise. Did you add any food coloring to the batter to make it that green? No, absolutely no food coloring was added. I just used matcha powder. 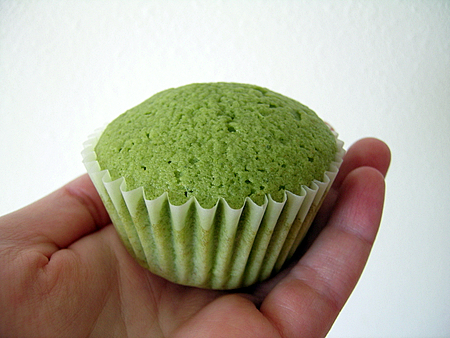 How green the final product is depends on how much matcha powder was used. If your batter is pale green before you pour it into the cupcake liners, you won’t end up with bright green cupcakes. Make sure your batter is close to the color green you’d like. Also, make sure your matcha powder is fresh and bright green.